A complete hypo-allergenic holistic dog food for adult dogs (from 6 months onwards) to maintain good health. Particularly suitable for the avoidance of food intolerance. 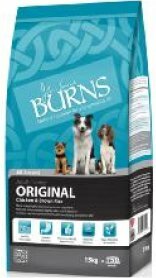 Burns Chicken and Brown Rice is suitable for seniors and may be used as an alternative to the veterinary and prescription diets.